At Pain Physicians NY we offer a minimally invasive approach to treat serious spine conditions including spinal fractures due to osteoporosis, benign lesions or even cancer. Because minimally invasive surgery usually requires only tiny incisions, patients generally return to their normal daily activities much faster than with traditional surgery. Schedule an appointment and find out if you are an appropriate candidate for minimally invasive spine surgery. Advances in technology have made it possible to treat spine problems and spine medical conditions by using minimally invasive surgical techniques. How can you benefit from a minimally invasive spine surgery? Quicker return to daily activities and normal life. Requires a well-trained and competent surgeon. What is the difference between minimally invasive spine surgery and open spine surgery? Open spine surgeries are considered as traditional surgical procedures. During an open spine surgery a larger incision will be made, followed by a muscle retraction on the side in order to get a clear view of the spine. This will normally lead to a certain amount of trauma to the body, followed by pain for a longer period of time and a slower recovery. Your intra – hospital stay will be also longer when compared to a minimally invasive spine surgery. However, on the other hand, the same operative goals can be achieved with a minimally invasive spine surgery. The surgical incision is smaller when compared to open spine surgery. There is less trauma to the body, less scarring, less pain after the surgery followed by a shorter recovery after the surgical procedure. So, why not consider minimally invasive spine surgery first? How is minimally invasive spine surgery performed? Minimally invasive spine surgery can be performed through the skin, known also as percutaneous, or through a small incision, known also as mini – open. After the incision is made, tubular retractors are inserted, creating a tunnel and holding the muscles retracted throughout the procedure. Small instruments along with tiny cameras are inserted allowing the surgeon and staff to view the operation from a flat panel monitor. 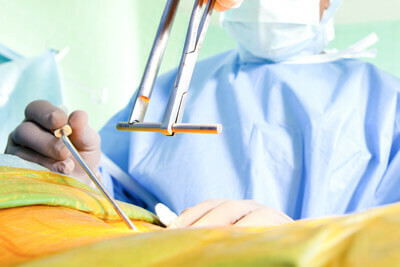 Tubular retractors are removed at the end of the procedure and the incision is closed with stitches. What to expect after a minimally invasive spine surgery? Because minimally invasive surgery usually requires only tiny incisions, patients generally return to their normal daily activities much faster than with traditional surgery. The exact length of time and the speed of the recovery differ from one person to another, varying also from the individual procedure. Injury to the nerves or blood vessels nearby, etc. In certain cases, a minimally invasive spine surgery may convert to an open spine surgery. If you are considering a minimally invasive spine surgery, keep in mind that any case is individual. You can always schedule an appointment and find out if you are an appropriate candidate for minimally invasive spine surgery. Recommended in cases with spinal fractures due to osteoporosis, benign lesions or even cancer. This medical procedure tries to restore the normal function and anatomy of the vertebral column, by inserting orthopedic balloons, which gently elevates the fractured vertebrae, attempting to return it to its normal position. The most advanced pain management center, Brooklyn back pain management doctors and specialists at Pain Physicians NY offer unique, individualized approach to manage your pain. We are using the most effective back pain management options including Platelet Rich Plasma (PRP) Injections and utilizing the latest technologies available in USA.